Is it true that in 1969 an Italian man was charged with selling fake Parmesan cheese made out of grated umbrella handles? The tale of the umbrella-handle parmesan cheese has been doing the rounds for quite some time. It keeps popping up, kind of like mold on cheese. The tale, as told, is never long. Rarely more than a single sentence. And it's always scant on details. The cheese forger is never named. He's just an "Italian man." Most recently a reference to the story appeared in New Scientist ("Feedback" — March 26, 2016). The magazine's editors had the sense to ask, "Can this be true?" But most of those who pass along the tale aren't as skeptical. For instance, the writers of BBC TV's QI game show have offered it up as a strange fact on their Twitter feed, and it's appeared as a "Today I Learned" factoid on Reddit. 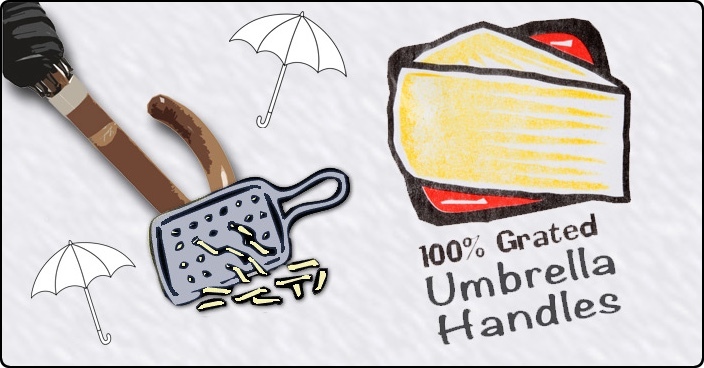 In 1969, an Italian man was caught selling ‘grated Parmesan cheese’ which turned out to be grated umbrella handles. The story is popular with authors of books about food. It's repeated, without question, in The Science of Cheese (2014) by Michael Tunick, Professional Cooking (2010) by Wayne Gisslen, Terrors of the Table: The Curious History of Nutrition (2006) by Walter Gratzer, and The Food System (2014) by Geoff Tansey and Anthony Worsley. Looking further back, food columnist Phyllis Magida mentioned it in the Chicago Tribune (Feb 23, 1984). And it appeared in an article about food adulteration in Parade magazine (July 25, 1982), though with a twist. The rogue cheese maker here was described as being English, not Italian. Even further back, the umbrella cheese pops up in Food In History (1973) by Reay Tannahill, with the nationality of the cheese faker again Italian. 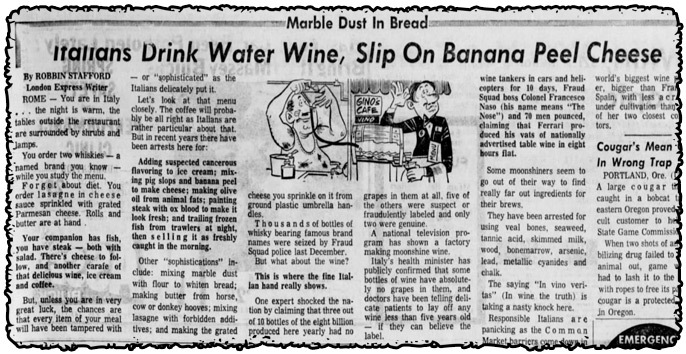 And as far back as March 1968, London Express writer Robbin Stafford warned in a syndicated article about various tricks used by Italian food fakers, including "making the grated cheese you sprinkle on [lasagna] from ground plastic umbrella handles." But here we've arrived at 1968, which is before the case of the umbrella-handle cheese supposedly happened. So unless there are multiple cases of Italian men grating umbrella handles, the date of the incident must be wrong. The stomachs of Italian cheese-lovers fluttered today when a million-dollar racket based on a cheese made from garbage with a plastic binder was exposed. In the northern city of Milan, food inspector Dr. Mario Amendola said more than 6000 pounds of this remarkable product were being bought daily by Italians. The cheese, he said, has "an ugly green color" and its content is "a mass of different kinds of waste and garbage." "The binder," he said, "is a plastic normally used to manufacture buttons, umbrella handles, toys, and combs." To sell what they described as regenerated cheese, the manufacturers had it grated. It was sold as parmesan in one-pound bags and used by thousands of Italians to sprinkle on their pasta. 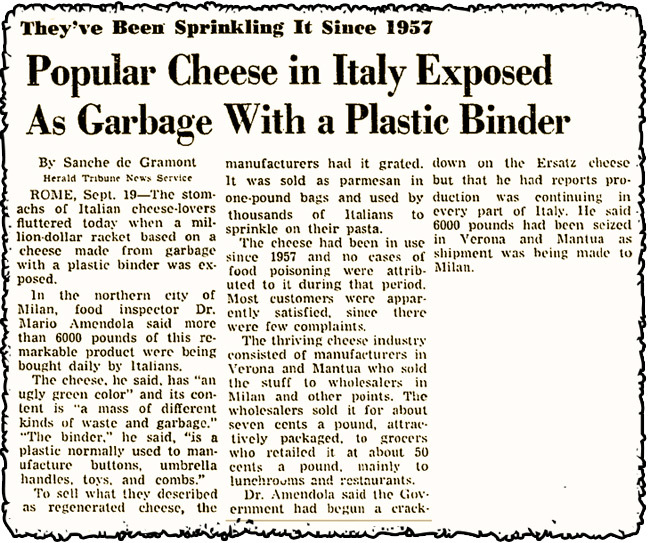 The article goes on to describe how this fake cheese had been sold since 1957 for an enormous profit. Wholesalers sold it to grocers for seven cents a pound, who then resold it to consumers for about 50 cents a pound. Remarkably, no consumers had ever complained about the cheese. This "regenerated cheese," as described, sounds disgusting, but it wasn't made from grated umbrella handles. Instead it contained a "plastic binder" also used to manufacture umbrella handles. At some point between 1962 and 1968 the plastic binder evidently transformed into grated umbrella handles. Which is understandable, because the image of an Italian worker toiling away at grating umbrella handles is too good to resist. Another 1962 news article about the Italian food scandal (The Brandon Sun - Oct 17, 1962) contained slightly different details. Instead of the "plastic binder," it described the fake cheese as containing "dairy by-products used to manufacture buttons and umbrella handles." These "dairy by-products" sound more credible as a cheese additive to me than a "plastic binder." But then, I don't know much about the science of cheese additives, nor about manufacturing umbrellas. Anyway, in either case no one was making cheese from grated umbrella handles. The tale of the umbrella-handle parmesan cheese belongs to the popular news genre of food-additive horrors. For decades, going back all the way to the days of muckraking journalism in the early 20th century, journalists have loved to detail all the incredibly gross stuff that ends up in commercially prepared food. Often these reports are disturbingly true. For instance, when Upton Sinclair described in his 1906 novel The Jungle how sausages contained the dead rats and garbage shoveled up from the factory floor, there was every indication this was accurate. But in many cases (such as the umbrella-handle cheese) facts get distorted or over-sensationalized. What was really going on was that manufacturers were adding food-grade, powdered cellulose to cheese — made from wood pulp, yes, but flavorless and harmless. It was a legal additive, often used as a stabilizer in ice cream and yogurt. It helped prevent the cheese from caking inside the package. The problem was that the label said "100 percent parmesan cheese" — failing to mention the additive. 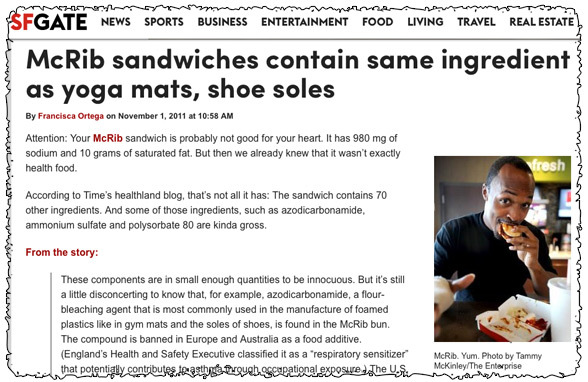 Another case of a sensationalized food-additive scare occurred in 2011, when headlines warned that McDonalds McRib sandwich contained the same ingredient as found in yoga mats. The Boulder Examiner coined the term "McYoga Mat." In this case, the bun of the McRib sandwich contained trace amounts of azodicarbonamide, a chemical (approved for use in food by the FDA) used to condition dough, but also used as a blowing agent by manufacturers of vinyl foam. Thus, the yoga mat connection. It's easy for that phrase "also used to manufacture" to get dropped when people re-tell tales. So it wouldn't surprise me if in fifty years a tale is circulating alleging that back in 2011 McDonalds was caught selling McRib Sandwiches made from ground-up yoga mats. "dairy by-products used to manufacture buttons and umbrella handles." This sounds a lot like one of the milk-based plastics that was used in the early 20th century.